Cut the butternut squash length wise and remove the seeds. Place on an oiled cookie sheet flat side down and roast in a 400 degree oven for 30-40 minutes. When the squash is ready chop the garlic and onion and saute in a pot with Apollo olive oil until translucent. Add the stock and the wine then scoop out the squash from the rind into the pot. Bring to a boil. 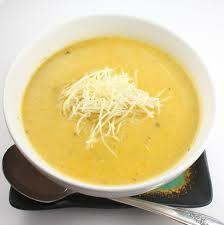 Turn the heat to low and use a hand blender to puree the soup. Add the cream and nutmeg then season to taste with the salt and pepper. And stock to thin or cream to thicken the soup according to taste. Spoon into bowls and drizzle your favorite Apollo olive oil on top. Top with parmesan cheese.